Foxfire 4, released in the Fall of 1977, continues to compile the best articles that inform readers on topics such as knifemaking, wood carving, gardening, fiddle making, and much more. 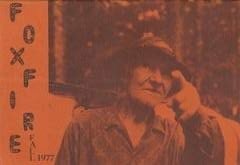 Anyone that has a love of the Appalachian mountains and is interested in rediscovering the advantages of living a simple life will enjoy this read! Next post: Planning for Inquiry: It's Not an Oxymoron!